It seems as if the political temperature in the Indian Ocean region is not going to ‘settle down’, as we predicted a week ago, but has already started to rise. That is demonstrated by the worsening situation in the Maldives, which is taking on the character of an internal political crisis, although in this case there has been an external element in this crisis right from the beginning. The external element in question is the increasing competition between India and China (the two main regional powers) in the Indian Ocean region as a whole. Incidentally, ‘on the horizon’ of the events in the Maldives we can also see the leading world power- the USA- and there is little doubt whose side it is on. The reason the Maldives have attracted so much attention is clear. This country, which has been independent since 1965 and has a population of approximately 400, 000 and which is made up of several hundred coral islands spread out from North to South over a thousand kilometers, is located right in the path of one of the main global transport arteries. Control over that transport route is vitally important to both China and India (and also to Japan, a potential ally of the former). This is because the route provides these countries with hydrocarbons – the ‘life blood’ of any modern economy. Whoever controls the Maldives has their finger on the pulse of hydrocarbon transport, and, if necessary, can exert pressure on their geopolitical opponent. That is why it is inevitable that two camps have developed in the very modest political arena of the Republic of the Maldives. One of these, the ‘Pro-Chinese’ camp, is led by the current president, Abdulla Yameen, who has been in office since September 2013. 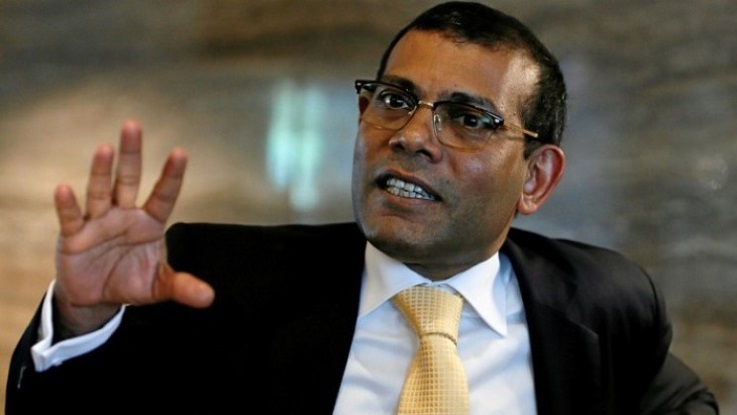 The other one, the ‘Pro-Indian’ camp, is led by Mohamed Nasheed, the president from 2008-2012. In October this year the next presidential elections are due to take place, and, according to certain forecasts, Mohamed Nasheed has a good chance of winning. It looks as if that why the current president has decided to take ‘preventative’ measures. On February 6 a number of Mohamed Nasheed’s supporters were arrested, including the senior judge of the Supreme Court and his deputy, and the Supreme Court itself was disbanded. These steps were a response to the Supreme Court’s unanimous ruling of February 1, which invalidated certain earlier repressive measures directed against Mohamed Nasheed’s supporters. In the Maldivian capital, Malé, protests broke out against Abdulla Yameen, who declared a ‘state of emergency’ for two weeks. On the same day, February 6, India’s Foreign Minister issued a press-release, ’Situation in Maldives’, stating that the Indian Government was ‘disturbed’ by the arrests and by the ‘State of Emergency’ in the Maldives. It also stated that the Indian Government continued ‘to carefully monitor the situation’. At the same time as the press release, reports appeared of preparations by India for an intervention in the Maldives, involving some 1500 special forces. In response to these reports, the Chinese ‘Global Times’ published an editorial with the headline ‘India must stop intervening in Malé’. In the editorial, the ‘Global Times’ speculated, among other things, that New-Delhi’s concern was due to the rapid development of economic links between China and the Maldives, as evidenced by a bilateral Free Trade Agreement between the two countries and President Abdulla Yameen’s declared interest in joining China’s ‘One Belt, One Road’ initiative. It also claimed that the current government of the Maldives had a ‘friendly attitude to China, without being unfriendly to India’. As if in confirmation of that remark, Abdulla Yameen sent a special envoy to Beijing, and proposed to Narendra Modi, the Indian Prime Minister that he would send his Foreign Minister to India in the same capacity. The Maldivian special envoy arrived in Beijing, but, New Delhi declared that it is not yet ready to receive such an envoy. On February 8, in a press conference the official representative of the Chinese Foreign Ministry once more declared that the crisis in the Maldives was an internal matter and that it was essential that the ‘international community play a constructive role’ in resolving it. The situation in the Maldives was also discussed by Narendra Modi and Donald Trump in a telephone conversation on February 9. They decided to include the matter on the agenda of the next ‘2+2’ format meeting between the two countries’ foreign ministers and ministers of defense. As for the rhetoric used by China and India in their statements on the Maldives crisis, the phrases ‘another conflict zone’ and ‘New Doklam’ are worrying. Readers will remember that several months ago the two Asian giants were on the brink of conflict because a standoff in the Doklam plateau region of the Himalayas. The use of phrases referring to the recent dangerous standoff in connection with the current situation in the Maldives brings home the complexity of the relations between Beijing and New Delhi, despite the determined efforts by both countries to decrease tensions. It unlikely that India will commit itself to military action in the Maldives on its own. First and foremost, because this would result in unacceptable damage to its international reputation. But what will be the results of the upcoming ‘2+2’ meetings between the US and India? At the beginning of January these meetings were scheduled for this April. Will they be rescheduled because of the events in the Maldives?